The Mormon Tabernacle Choir have performed much of the best sacred material of all time, but the songs on Praise to the Man were undoubtedly even closer to their hearts. A collection of songs in tribute to Latter Day Saints founder Joseph Smith, the album includes new arrangements of many of the best-known LDS hymns, including the title track — itself written in tribute to Smith. With the Orchestra at Temple Square, the choir begins, fittingly, with "The Morning Breaks, " and after the title song, performs "Joseph Smith's First Prayer." Other LDS standards included are "Now We'll Sing with One Accord" and "Praise to the Man." It is so wonderful that they have released an album to commemerate and honor such a great and noble man who has changed the world forever. I agree, that I have never heard such an arrangement to "Praise to the Man" like the one in this CD. And I have heard many versions of "Praise to the Man", but none of them even compare. I also really love to listen to this version of "We Thank Thee, O God, for a Prophet". It has a message that can be spoken to the entire world! "We thank thee, O God, for a prophet. To guide us in these latter days. We thank thee for sending the gospel. To lighten our minds with its rays. We thank thee for every blessing, Bestowed by thy bounteous hand. We feel it a pleasure to serve thee And love to obey thy command." "When dark clouds of trouble hang o’er us, And threaten our peace to destroy, There is hope smiling brightly before us, And we know that deliv’rance is nigh. We doubt not the Lord nor his goodness. We’ve proved him in days that are past. The wicked who fight against Zion, Will surely be smitten at last." "We’ll sing of his goodness and mercy. We’ll praise him by day and by night, Rejoice in his glorious gospel, And bask in its life-giving light. Thus on to eternal perfection, The honest and faithful will go, While they who reject this glad message, Shall never such happiness know." Another OUTSTANDING album from MoTab! 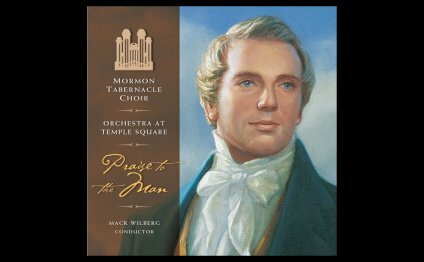 I would like to encourage Blasphemy to actually listen to, and comment on, the MUSIC of Praise to the Man, rather than giving a purely personal opion of LDS beliefs. MORMON TABERNACLE CHOIR - PARISE TO THE MAN.